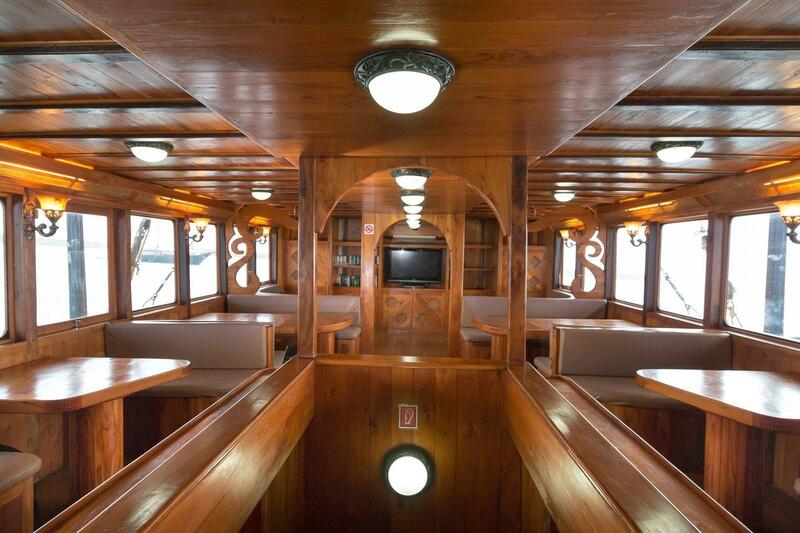 The 2 deluxe cabins (#1, #2) on lower deck feature the option of double bed or twin beds. 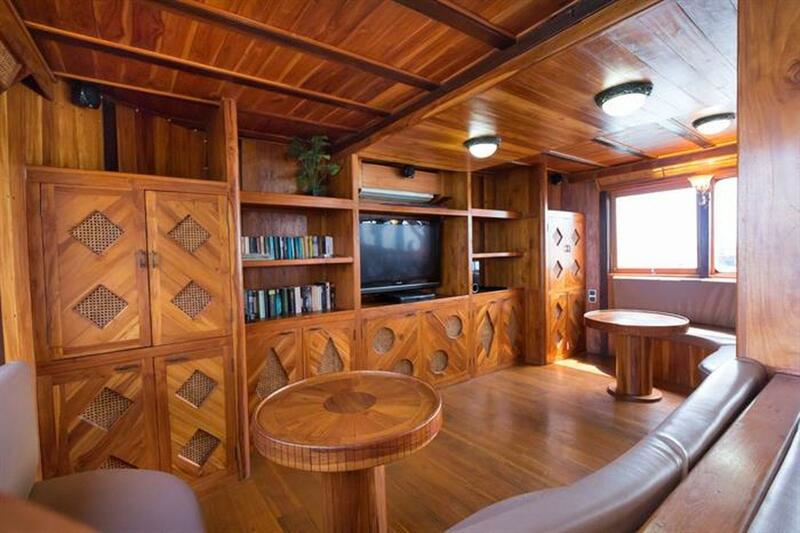 The other 2 deluxe cabins (#3 and #4) also on lower deck have the option of a double bed. Every room has its own private en-suite with hot showers, complimentary toiletries, climate control, ample room for luggage and a collapsible desk for filling out your log book after a fantastic day diving. Daily housekeeping included. These 2 cabins have a great view and feature double or twin beds. Every room has its own private en-suite with hot showers, complimentary toiletries, climate control, ample room for luggage and a collapsible desk for filling out your log book after a fantastic day of diving. The grand suite is a premium accommodation, everything you need for your ultimate liveaboard experience. This huge room has a King size double bed with an American style, deep sprung mattress, an extra large en-suite bathroom with complimentary toiletries, private balcony with table and chairs to maximise your panoramic views of the stunning Archipelago scenery, your own private lounge room with sofas and a state of the art 48” high definition flat screen TV, private fridge, balcony with 270 degree views. The sofas can also be used as 2 extra single beds. 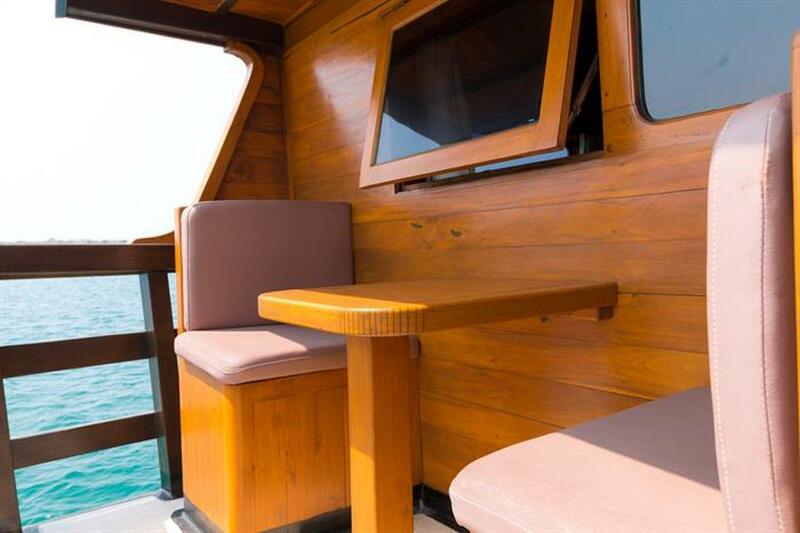 If there is a single diver that wants to book this cabin he/she will have to pay for double occupancy price Daily House keeping is included. New amenities: library of reading books, cold water dispenser, Nespresso coffee machine, media drives with documentaries and movies. Mobile phone network based internet capabilities (where coverage applies) with 25GB limit for the duration of the trip. 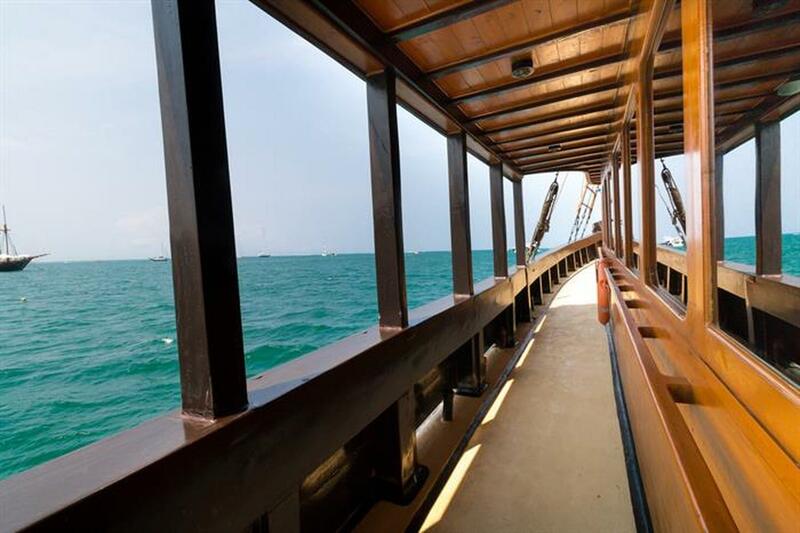 Built by traditional South Sulawesi craftsmen in 2012, the 33m La Galigo Dive Safari liveaboard is a traditional two mast Phinisi sailing boat. 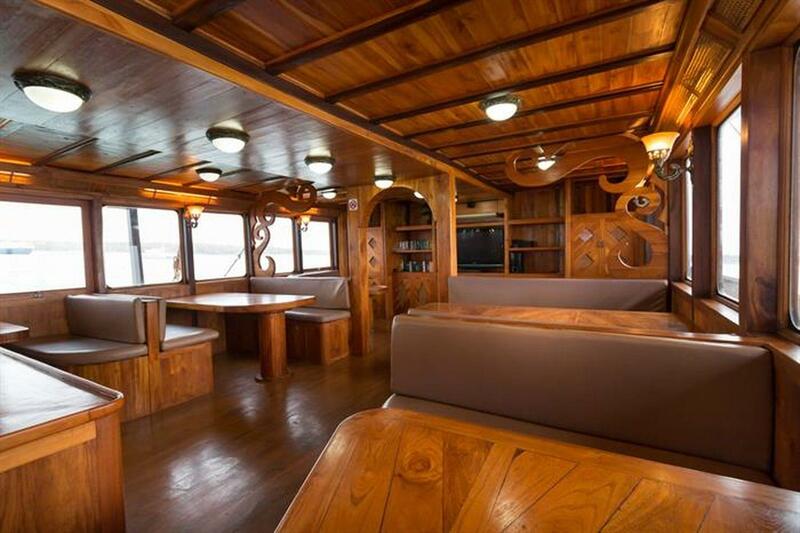 It was designed by an avid Diver built with liveaboard diving lifestyle and comfort in mind. 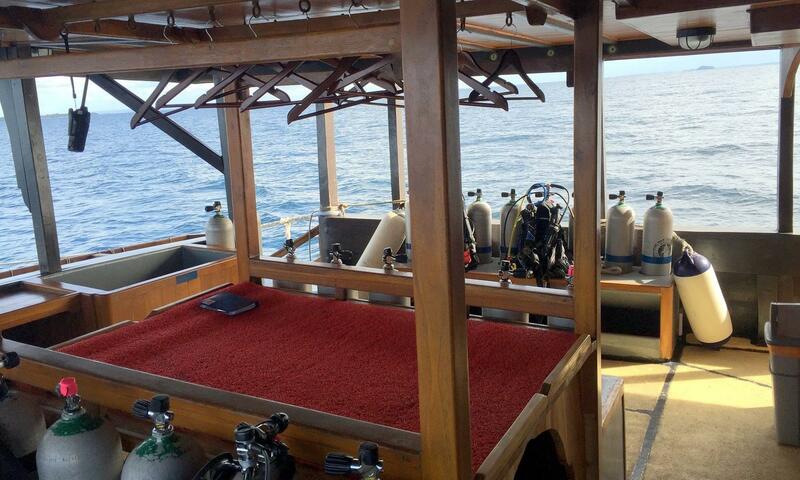 His main focus was to transport fellow Divers in comfort to the World class dive sites of Indonesia. La Galigo offers year round diving in Indonesia, including Raja Ampat, Komodo and beyond, offering Divers some of the most bio-diverse rich waters available. As well as enjoying up to 4 dives a day, 3 day dives plus Sunset or Night Dives, we offer a number of land excursions to explore the stunning scenery, including trekking, visits to local villages, beach barbeques and visiting the indigenous wildlife. 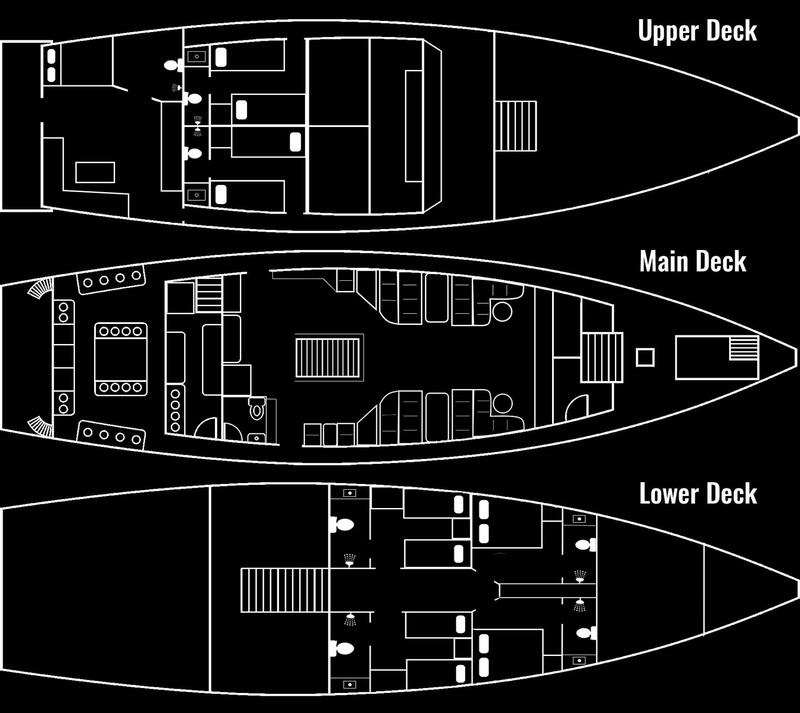 The La Galigo is 108 feet (33m) long and has 7 privately controlled air-conditioned, en-suite cabins each with an American style deep sprung mattress. Cabins are either Twin or Double bed. For added luxury you can choose ’The Suite’, which has everything you need for your ultimate liveaboard experience, including a fridge, a 48” HD TV and a private balcony with 270 degree view. The Master Suite is perfect for families accomodating 4 people. Every cabin has its own private bathroom with hot showers, complimentary toiletries, daily housekeeping, individual climate control, ample room for luggage and a collapsible desk for filling out your log book after a fantastic day diving. 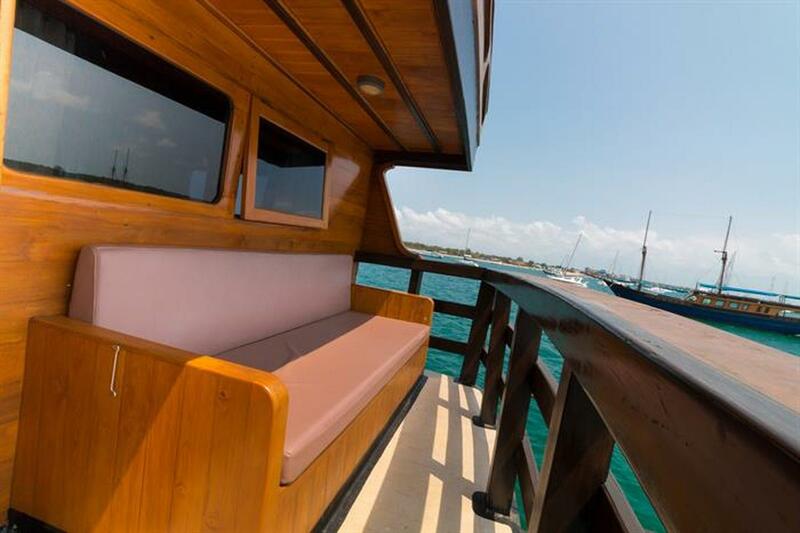 The main deck of La Galigo is where guests will enjoy the spacious living and dining area. The beautiful spacious Salon offers a large TV and DVD player with a selection of movies, there is an iMac computer and a turntable sound mixer sytem with premium quality sound speakers. You will also find a well stocked library and multiple power points for charging laptops, cameras and video equipment. There, you can hang out at the Bar with your buddy with your favorite drink and talk about the day’s dives. Take advantage of one of our outdoor living areas to enjoy the tranquil ocean breeze on our reclining chairs, or benches, or nap on the cushioned lounge chairs, hammocks and Bean Bags or work on your tan. For those that prefer more activities, they can enjoy a land excursion or spend some time snorkeling to further enrich their views of the incredible underwater scenery. The crew of the liveaboard La Galigo goes above and beyond to deliver large and freshly prepared meals to ensure Divers are well fed for their action packed dive safari adventure. Guests will have access to Chef prepared Western and Indonesian menu selections.Vegetarian and Vegan diets can be catered for simply by indicating your diet specification before your voyage. Non alcoholic drinks, tea and coffee are included. Beer and wines are available from our Bar for purchase. 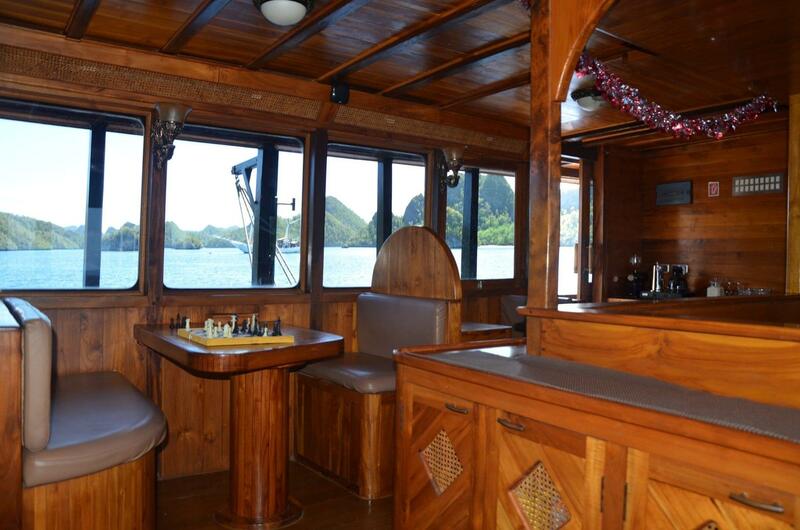 With a 15 English and Indonesian crew members for an average of 14 guests, the service is personalised and friendly.